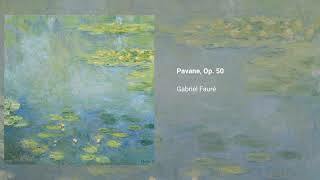 Gabriel Fauré wrote his Pavane in F sharp minor, Op. 50, in 1887. 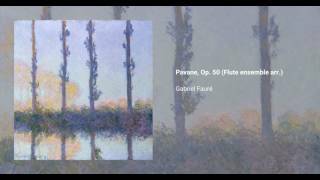 Originally conceived as a piano piece in 1880, Fauré reworked it as an orchestral piece in 1887. He planned on using modest orchestral forces, intending the piece to be played at some light summer concerts under the batoon of Jules Danbé. However, upon his dedication of the piece to his patron, Elisabeth Countess Greffulhe, he was convinced to expand the instrumental forces and add an invisible chorus to accompany the orchestra. The lyrics were provided by the countess' cousin, Robert de Montesquiou. This orchestral version became widely know, and since its premiere in 1888 the piece has enjoyed inmense success, with or withouth the choral accompaniment.